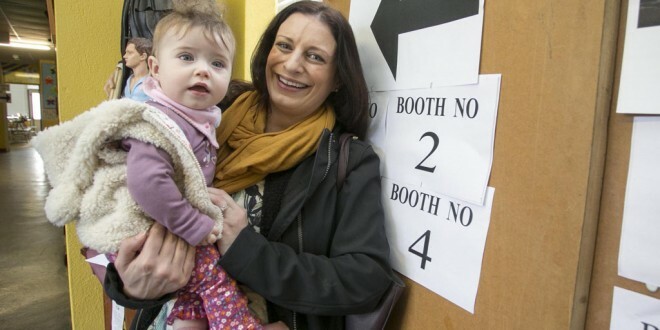 Aoife O'Brien with 8 month old Aoibhin arriving at CBS National School in Ennis to cast her vote this morning. Photograph by Arthur Ellis. Polling stations around the county opened at 7am this morning (Friday) for voting in General Election 2016. The stations, which accommodate 146 ballot boxes, will remain open until 10pm tonight. 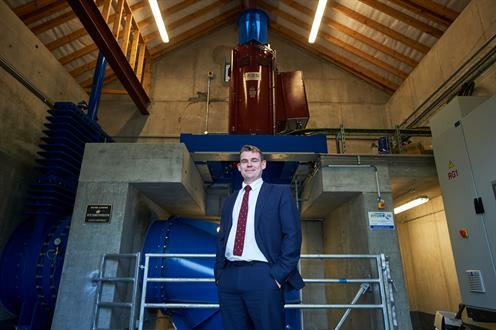 There are 16 candidates in the field in the Clare constituency, with four seats to be filled. A total of 82,965 people are eligible to vote. 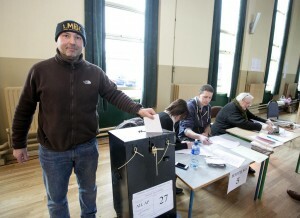 Anthony DiLucia casting his vote at The Holy Family polling station in Ennis. Photograph by Arthur Ellis. Based on the statistics of the 2011 General Election, when there the was the same number of candidates, on a 70% turn out of voters, the quota will be in the region of 11,600. The count will take place in the Falls Hotel, Ennistymon, on Saturday, with proceedings starting at 9am. The North Clare venue was selected because the All-Ireland darts competition is taking place at Treacy’s West County Hotel this weekend. 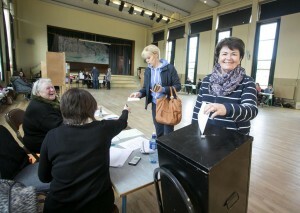 Maura Corley casting her vote at The Holy Family polling station in Ennis. Photograph by Arthur Ellis. However, in an amusing twist, the Falls Hotel function room will share a wedding and the General Election count on the same day. The Friday wedding is scheduled to run into the early hours of Saturday but management have made arrangements for the celebrations to continue in another part of the hotel, in order to facilitate the transformation of the function room into a count centre for the first time ever.